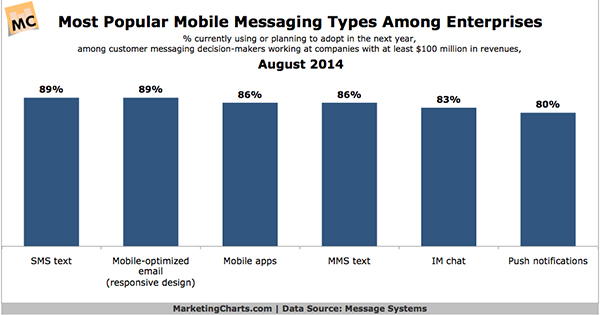 Today, we’re announcing the results of a survey on mobile messaging in the enterprise that Message Systems commissioned Harris Poll to conduct. The survey has a focus on who is embracing mobile messaging, how they are using it, and what they are spending on it – presently and in the future. We moved forward with the assumption that most business were aware of the marketplace changes being driven by mobile, and that most were already adapting their marketing, engagement and customer service practices to address the new messaging environment. But to what extent? That is what we endeavored to find out in our mobile survey, and we’ve outlined five key takeaways from our survey below. In our view, sizable majorities of marketers realize that the communication landscape is rapidly changing toward mobile channels, and they are acting accordingly to accommodate their mobile customers. Not surprisingly, text and mobile email – the longest established messaging types – are leading the way as channels for reaching mobile customers. At nearly 80% adoption, push notifications are not that far behind, however. We were a little surprised to see 89% of customer messaging decision-makers say their companies have adopted or are planning to adopt mobile optimized / responsive design for email. Our very unscientific personal experience is that the vast majority of commercial email today is still produced in standard HTML. But it’s great to see such a high number of these companies understanding that mobile optimization is a concern to be addressed. Ninety-one percent of customer messaging decision-makers report that their company currently supports, or plans to support in the next 12 months, time-sensitive reminders and notifications through mobile channels. In our view, we see this widespread intention to adopt time-sensitive notifications as a realization that mobile is a more time-sensitive environment than the desktop web. More so than with TV or the PC / laptop experience, timeliness and immediacy are key to the mobile experience. Marketers understand that getting information in front of customers at the most opportune time is critical, and they are embracing mobile messaging as the ideal channel through which to do so. Seventy-two percent of customer messaging decision-makers say that their company currently uses location-based mobile strategies or plans to use them in the next 12 months. As with timeliness, our belief is that marketers understand that location adds an important dimension to communicating with customers on the go. Fewer customer messaging decision-makers say their companies are embracing location-based strategies than those embracing timely reminders and notifications, but the percent is still a strong majority. It should be noted that these customer messaging decision-makers were from a very wide range of customer-focused industries. Based on how it’s usually depicted in the media and analyst reports, location-based messaging would seem to always revolve around retail scenarios or service-oriented interactions, such as with banking. But even while the survey found variable and not necessarily large percentages from each industry (but rather collectively a large number) it’s clear nonetheless that customer messaging decision-makers from various industries such as publishing, media, telecommunications and e-businesses also perceive location-based messaging as potentially valuable for their businesses. The marketers surveyed understand that they have many new techniques and possibilities for reaching customers, whether in retail situations, service situations or conditional situations, e.g., weather. Eighty percent of customer messaging decision-makers consider it a critical/high priority for their company’s mobility and engagement strategy to support a wider variety of mobile devices and platforms over the next 12 months, with 31% calling it a critical priority. Our takeaway is that the rapid pace of change in mobile is generating a high level of concern among these marketers that they could get left behind the curve, and potentially not be able to reach their customers as freely as they can today. Device vendors, OS platforms and messaging infrastructure providers would be wise to ensure that the mobile Internet continues to evolve as a standards-based environment. Vendors that can remove complexity from the mobile equation are likely to be at an advantage. Clearly, the changes to the customer communication landscape being driven by mobile technologies are top-of-mind for a healthy majority of the customer messaging decision-makers participating in the survey. It’s worth repeating some key finding from the Meeker Report we mentioned in the previous post on this survey: 25 percent of all global Internet traffic is now traveling over mobile devices, and most emails are now opened and read on mobile devices also. The odds are strong that these figures will continue to grow in the years ahead. The marketers we surveyed, in large part, indicate that they are adopting or plan to adopt the mobile messaging strategies that they will need to get out in front of these changes. Overall, it’s Message Systems position that companies that don’t already have a mobile messaging plan in place today are likely find themselves playing catch-up at a later date. This survey was conducted online within the United States by Harris Poll on behalf of Message Systems between April 23 to May 19, 2014 among 208 US full-time employees of companies with an annual revenue of $100M or more, who are employed at the director level or higher in key departments (administrative/executive, customer service, e-business/e-commerce, production/operations, IT, marketing, communications, or advertising), and have at least a major influence in decisions regarding their company’s mobile messaging efforts. This online survey is not based on a probability sample and therefore no estimate of theoretical sampling error can be calculated. For complete survey methodology, including weighting variables, please contact [email protected].